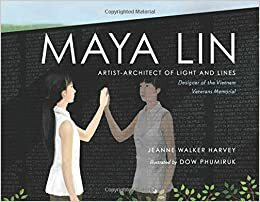 Summary: Maya Lin grew up surrounded by nature, books, and parents “who never told her what to be or how to think”, having left China to escape that kind of doctrine. Maya loved to create, inspired by her artist father and poet mother. In college, she decided to study architecture, combining her love of art, science, and math. When she was a senior, she entered a contest to design a memorial for the Vietnam War. Her entry was selected from 1,421 others. When the judges found out how young she was, they were shocked, and many felt that another design should be chosen. Maya persisted, however, and her dream of a beautiful black wall with the names of those who died in the Vietnam War became a reality. It was the first of many art-architecture installations that Maya continues to create today. Includes an author’s note with additional information about Maya Lin and the memorial. 32 pages; grades K-4. Pros: A quiet, beautiful work about a talented artist who persisted in bringing her creation to fruition. The digital watercolors by first-time illustrator Phumiruk perfectly capture tone of the book and the Vietnam Veterans Memorial. Cons: This only touches on details of Lin’s life, and is not a complete biography.